A person who is obsessive, too particular about their work and wants 100% perfection in the work done. But it is true that many people find it difficult to work with perfectionists. When was the last time anyone enjoyed working with the person who was completely possessive about the work, very difficult to handle and not at all fun to work with. 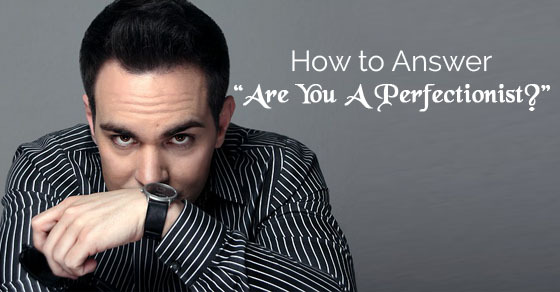 So, whenever a person is asked in the interview that, are you a perfectionist? never say yes. So, if ever asked about you being a perfectionist, try and highlight your weakness, that may be strengths of others working in the company and how you improved on them to improve yourself. Here is the list of certain weaknesses which a person should present before the interviewer. The perfectionist is one who is not able to say no to other people working in the organization. Such people are not able to annoy others and always an easy target for others. A person portrays his picture as a multi-task doing person, who is willing to do more work. They sometimes cover their co-workers work too, this will not only increase the workload but will also make it a habit for other employees. At the same time, the relationship between you and the other’s work in the organization is definitely going to improve and will definitely present a good picture before the employer. Also, it is going to make you look the most reliable employee in the organization. A perfectionist is a person who always holds himself responsible if anything goes wrong with the project he is working on. Such a person is always seen as the midway between doing things. Many people take advantage of such a quality of a person as they knew that if there is any mistake then they will not be held responsible. But, don’t be too harsh on yourself and let things a little loose. If there is anything wrong with the project, then try and improve on it rather than blaming yourself. According to many researches done, it has been found out that a person who presents himself as a perfectionist is always more unhappy and dissatisfied as compared to the one who is less focused on works perfection. If somehow the work goes wrong or there is some mismanagement, then he might create panic at the work place, thus creating a nuisance in the office. Don’t create a panic because it will disturb the entire working atmosphere of the organization. So avoid creating panic, rather help others in correcting the mistakes and calm down others. This way all the members of the team who are working with you will not only have faith on you, but will definitely find you more reliable to depend upon. A perfectionist is one who always tries to set unachievable deadlines before the team. In such a situation the employees often get too pressurized and sometimes even miss the deadlines set for them. So, not only the morale of the employees is discouraged but also results in wastage of both time and money of the employees. All the goals which he might achieve because of his obsession might prove difficult for others. Some people may treat perfectionism as a sick state of mind, but it can always be cured. Instead of setting impossible targets, set those targets which are more achievable and motivate others to work hard and try and achieve those targets. A perfectionist is a person who always wants everything to be absolutely perfect. Sometimes, there are certain work areas which involve chances to be taken. But, a perfectionist will never take a chance as he wants everything to be up to the mark. This may result of losing some golden business opportunities and may also hinder the growth of the company. In a job, taking risks helps employees to learn more and upgrade themselves. Try and take risks, but before that do all the kind of research that is necessary to take various decisions. A perfectionist is a person who is ready to take up challenges and to complete them with full sincerity. But, sometimes there are certain challenges which are difficult to achieve. A person who takes up such challenges not only wastes his time and energy, but also the resources of the company. So, he shall try and avoid taking such challenges and be practical in his approach towards work. Try and explain the interviewer that how you took up various challenges and tried to achieve it to the fullest of your strength. Also, explain the various problems that you have to face during your work process. Explaining the interviewer that the resources of the organization are equally important to you and you will never try and waste them. A perfectionist will never acknowledge his own weakness and have to work in those areas which can hinder his performance and make him put more efforts than required. Such a person finds it difficult to accept that every person has his own strengths and weaknesses. He will neglect this and without realizing the damage that may occur he will continue to work. A person should always acknowledge his weaknesses and try to overcome them. Correcting the weakness will improve the personality of the person and will make him able to do his job in a better way. A person who finds himself as perfectionist wants everybody to work like they do. But, all the people are not equally capable of doing things. So, a person shall not lose his temperament on others. He shall not treat the people working with him with less respect and shall not look down on them. All of us who are working together shall help each other and treat all with equal respect and shall understand each other’s level of work. A person shall always try to tolerate others mistakes and motivate them to avoid making mistakes. Every organization is working to provide services to its customers at any cost and of any type. What is perfect for the customer is always the right thing. Such a task is difficult to handle for a person who claims himself to be a perfectionist because what seems perfect to him might not be perfect for the customer. He shall always be ready to handle such situations and be able to adjust accordingly. If there are differences between what the customers want and what the organization has to offer, try to make the corrections required. A customer is above and the organization has to do what they want. A person shall try and highlight his weakness of being unorganized before and how you improved this quality of yours. Being unorganized is not a good quality of a person working in the organization. Being organized is a quality which is mastered by some, but other people have to work on it. Always bring it to the notice of the interviewer that how you worked hard and became more organized in your work. An interviewer is always interested in knowing how a person overcame his quality and became more organized. While you are going to appear for an interview always make it a point that never boasts about your own self. Never underestimate the qualities and the qualifications of the other people who are appearing for the interview. An interviewer always wants to hire those professionals who think more about the company than their own self. Always put the company before your priorities. So, present a picture before the interviewer that you are ready to do anything for the company. A person who is going to appear for the interview should always do research about the company. He should have knowledge about the various policies of the company regarding salary, vacations and various other important matters. If the person appearing for the interview asks a certain question about the policies of the company regarding various matters, then he will appear as unprepared and not at all aware. So, having complete knowledge about the company is very important on various matters. While you are in the interview, never ask such question which presents a wrong picture about you. A company where a person is going to spend 8-10 hours daily, there will be certain things which he always wants to know. If a candidate does not ask any question to the interviewer then he may appear as not interested in working for the company. Always try to ask the questions about the working style, the kind of people working in the company and various other things. This will show that the person has knowledge and interest in the functioning of the company. This will also show the research that a person has done. In a company, there are always many projects that are going at a time. A person has to know the skill of multi tasking to be able to handle such a situation. If weakness of the person makes the work suffer, then he shall try and find a solution for the same. The candidate shall explain his way to handle multi-task and the techniques he uses to complete the project. There is always a limit to which a person can work. Every person has his own limits. A candidate sometimes takes up work which proves difficult for them to complete. This not only reduces their efficiency but also reduces the quality of work. So, a candidate shall always try to take up only that amount of work which he can do efficiently. This way he can give his best to all the projects and do better quality work. A true perfectionist is always obsessed with doing the work to the best he can. They even sometimes struggle with this quality and also face self-defeating behaviour. Such people not only loose temperament easily, but are also very easy to make reactive to any situation. A candidate shall always try to explain the interviewer that they only take limited work and only focus on it. No matter how many interviews a candidate has to appear for, he shall never say that I am a perfectionist. He shall always be truthful to the interviewer and always present the right quality before them. If asked about the weaknesses in interview by the interviewer then he shall not at all hide them and also bring it to their notice the steps he is taking in overcoming them. Being truthful is the only way to save himself from the tricky and difficult interview questions of the interviewer. Something like perfectionism is very difficult to find and even more to handle. A person who claims himself to be a perfectionist finds it difficult to work in a team because they expect equal dedication from all the employees towards work which is difficult. Presenting these weaknesses before the interviewer and also the steps towards its solution can help a candidate to get that job.